New and expectant parents: congratulations on your little bundles of joy! With that excitement of having a new baby joining your family also comes much in terms of new parental responsibilities. Yes, this new addition to your family means a lot of hard work, many sleepless nights, and unfortunately, a LOT of new expenses. In fact, according to one recent estimate from Time, the cost of raising a child from birth to adulthood has reached nearly $235,000! That said, you are absolutely going to want to save money wherever you can, right? The good news is that there are a lot of companies who want to help you out by sending some free baby swag your way. Oh yeah, we are talking about baby freebies! This has got to be one of the best baby freebies currently available anywhere. Believe it or not, if you create your baby registry with Target, they will hook you up with $50 worth of coupons and handpicked samples! What if your friends and family don’t buy everything on your list? Well, Target’s got you covered: they will give you 15% off everything left on your registry after your baby is born. Now that’s SAVVY! Enfamil®and Enfagrow® Formula Samples – including 3 different kinds of formula and Nursette® bottles. Valuable “checks” – These are similar to coupons in terms of savings but are written and tailored to you. Special Offers – During your membership Enfamil will send you special gifts and discounts on birth announcements, birthday invites, etc. Learn more about this great set of freebies from Enfamil here. While taking advantage of this one does take a bit more work, this is one baby freebie that you definitely want to take advantage of! Gerber will actually send you a free 3-6 month onesie, a can of formula and a $2 coupon. Traditionally only available at hospitals and clinics, now all you have to do is give Gerber a call at 1-800-408-7277 and ask them about the Gerber Baby Nutrition Kit. 4) Diapers and More Diapers! Honest Company – Offering a free “Discovery Kit” of diapers & wipes and/or a trial of personal care & home cleaning “essentials”. All they ask for is $5.95 to cover shipping. While they are not currently offering free diaper samples, you might also consider signing up for the Pampers Rewards Program. With this program, you will earn rewards that can be used towards free diapers too (and a whole lot of other stuff)! If you are in a community served by the Imagination Library, your child could receive a free book each month every month from birth all the way up to 5 years old. The books available are a mixture of both fiction and non-fiction. Each month, your child will receive an age-appropriate book on various subjects. These include well-known titles such as The Little Engine that Could, The Tale of Peter Rabbit, Violet the Pilot and many, many more. This post from thebalance.com does a great job of explaining this wonderful program in more detail (and gives a step-by-step on how to sign up). Otherwise, to learn more and to register your child today, visit imaginationlibrary.com. Finally, there’s nothing wrong with having TWO baby registries, right? Like Target, Amazon is offering prime members a great incentive creating a baby registry on their site – a $35 welcome box of awesome baby freebies! In short, all you have to do is create your Amazon registry, spend $10 on any one of the items in your registry and then request your baby box once that $10 (or more) order ships. See the Amazon Baby Registry Welcome Box FAQ for more info on how to claim your Welcome Box. As you can see, there are some AMAZING baby freebies available to you as new parents! Don’t miss out on the chance to save money and get some great free stuff for your baby. 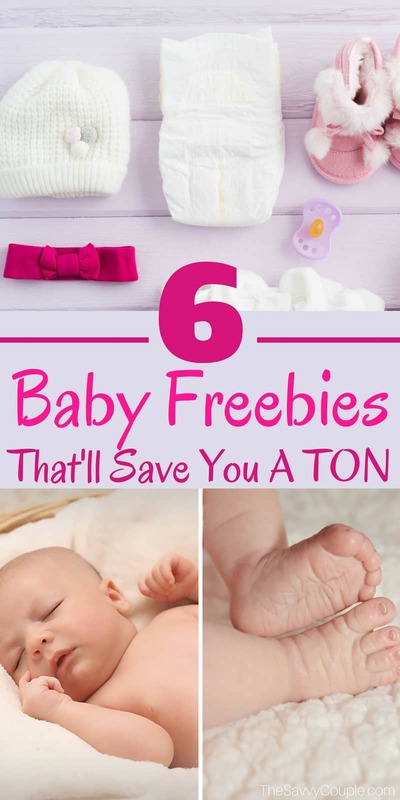 Grab some of these great freebies for babies today! This was a guest post from Beau Mueller the founder of The Moneywise Teacher. What are MUST HAVE items for babies? Follow us on Pinterest for more awesome freebies! Great post and thanks for the tips. This will be useful for the day when my wife and I have kids. Diapers are really expensive. They certainly are! We have them in our budget a few months ahead so we can get used to paying for them.